No.2 is an 0-4-0ST with 12 x 18″ outside cylinders and 3ft 0.5″ diameter driving wheels. She was built by R&W Hawthorn, Leslie & Co Ltd at their Forth Banks Works in Newcastle upon Tyne. Our locomotive was works number 2859, ex-works on 27/9/1911 to Keighley Corporation Gas Dept, Keighley Gas Works, West Riding of Yorkshire, where she was numbered 2. About 1940, she was sold to the Ministry of Supply, Royal Ordnance Factory, Dumfries Factory, Drungans, Kirkcudbrightshire, via the dealers George Cohen, Sons & Co Ltd. The factory was later taken over by ICI Ltd, Nobel Division, who moved her to their Grangeston Factory, Girvan, Ayrshire in 1949. After 1954, they moved her to their Powfoot Factory, Annan, Dumfriesshire, where she was numbered No.2. Nobels Explosives later took over the factory and she arrived at Marley Hill in June 1976. First used in the 1980s, No.2 is popular with visitors as she has no back to the upper half of the cab and they can see what is happening on the footplate. Following withdrawal in 1997, No.2 was first stored in the 5-Road Shed at Marley Hill. Here, all boiler tubes were removed. 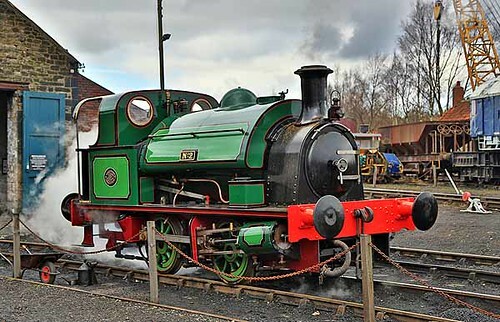 In July 2005, she was placed on loan to Locomotion, Shildon, where she was on display until January 2006, after which she returned to storage in the 5-Road Shed at Marley Hill. In 2009, No.2 was moved from the 5-Road Shed into the main shed at Marley Hill in order for overhaul to commence. This has been a comprehensive affair and has been carried out to a high standard. No.2 has received a new firebox, as well as a thorough mechanical overhaul. In September 2012, No.2 was steamed at Marley Hill for the first time following overhaul. The overhaul, including painting was completed in February 2013. Following numerous test runs, including hauling a passenger train for the first time in several years, No.2 was re-commissioned into regular service on the railway in March 2013. Photo: No.2 outside Marley Hill Shed in March 2013, prior to commencing a running in turn, by E.Garrod.